These heavy polished balls spins on a frictionless cushion of water and continues to roll until the water is shut off. Nevertheless, even a child can stop the marble balls (or granite balls) or change the direction of their spin, or set the ball on an accelerated twirl. The gap between the ball and the basin socket is about 1/4000th of an inch, so there is no danger of hurting child's fingers. 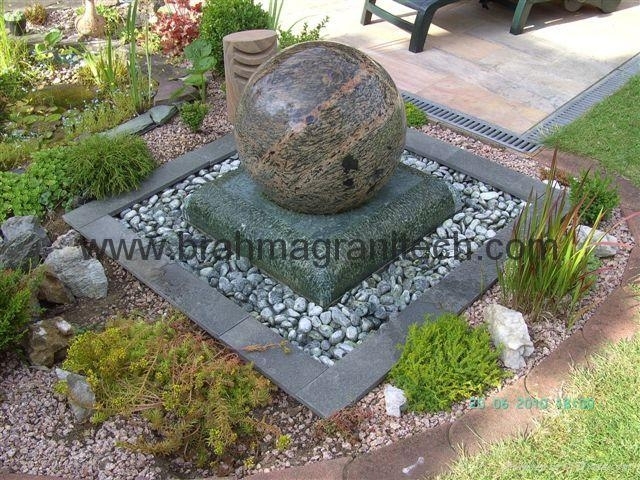 It staggers everyone's imagination to see these extremely heavy balls revolve around on such little water, it is miracle of stone floating spheres invented in india. Rolling on a thin cushion of water, these marble balls or granite balls (floating sphere) weigh between 200 pounds to 800lbs depending on the size. They will rotate with a weak water pressure (10 psi, less than what water hose generated 85 psi.) This very stylish Chinese artistic work can make your shop, office, garden and home look impressive. These heavy marble balls are perfectly symmetrical that they can revolve 360 degrees in any of directions with a slightest touch. It is a perfectly balanced, highly polished marble or granite sphere that fits precisely into its carved basin to conform to the exact curvature of ball. These heavy polished balls spins on a frictionless cushion of water and continues to roll until the water is shut off. Nevertheless, even a child can stop the marble balls (or granite balls) or change the direction of their spin, or set the ball on an accelerated twirl. The gap between the ball and the basin socket is about 1/4000th of an inch, so there is no danger of hurting child's fingers. It staggers everyone's imagination to see these extremely heavy balls revolve around on such little water.just email us for videos.